Need a luxurious bouquet for a special occasion? This glamorous combination of bright red roses, dark purple roses, light pink roses, white spray roses and ruscus will make a very thoughtful gift that will make a great impression! I will certainly be using this florist again. Bold, beautiful and brilliant colours, interwoven with soft pinks and creams. I highly recommend them to anyone reading these reviews to take the plunge, order and have them delivered. Super convenient as well, as I don't have to travel and fuss around with a flower shop. Every bouquet I've ordered has been very unique and beautiful. You can tell a lot of time and skill goes into creating the designs they showcase. Even when you order the same bouquet twice there is always something a little special about it that sets it apart from others. 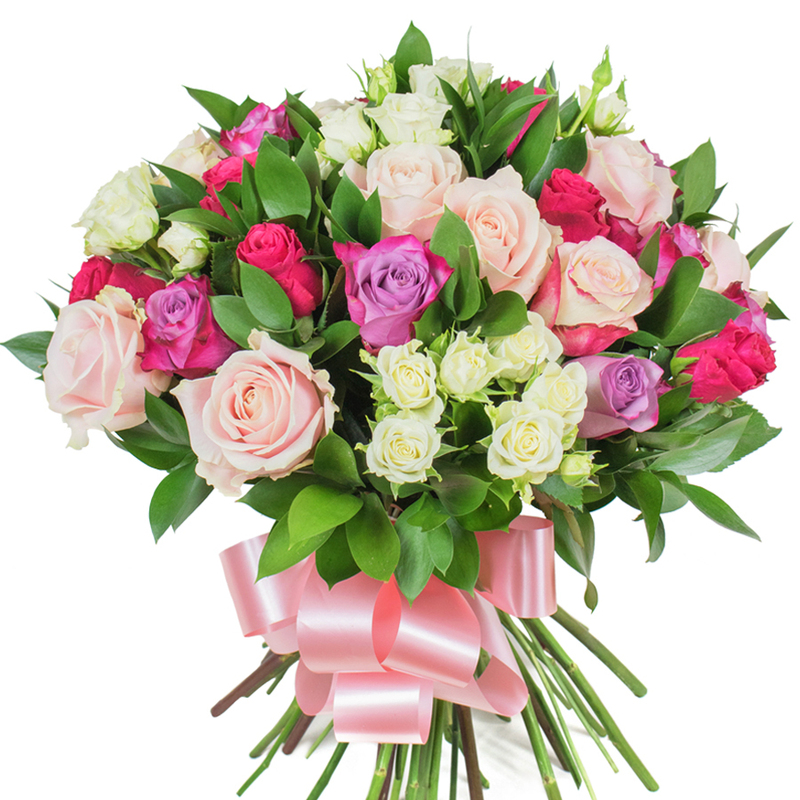 Roses in different colors are always the best path to a woman`s heart! Thank you! Just dropping a line to say that the flowers arrived safely and are perfect for the anniversary! thanks! Abundant bouquet! Artfully arranged and delivered on time. My friend liked the bouquet very much! She wasn't at home at the time for delivery, however the flowers were left at the front door as requested. Very reliable company! This bouquet was delivered as a gift for my birthday from my dear husband. It is really GLAMOROUS! My heart is full of joy because of this bouquet! It is an amazing gift, I love my husband for making this sweet surprise for me! Ordered it for a very special girl. She told me this was the most amazing bouquet she's ever received. Big, big thank you!!!! Real value for money! I've ordered couple of times from Handy Flowers and they always deliver great flower arrangements! THANK YOU! Gorgeous! My wife was over the moon with this bouquet! This bouquet made my anniversary magical – the flowers were astonishing and the arrangement was truly one of a kind! Great job Handy Flowers! I’m so glad I found Handy Flowers! Their flowers are all fresh, the designs look great and they deliver quickly and for cheap rates. My girlfriend loved this bouquet! She said she’d never seen such ravishing flowers combined in such an elegant design. Big thanks!